We call this “Grandpa’s Barn Quilt” because each one of these beautiful barn blocks were lovingly stitched by Grandpa. Didn’t he do a beautiful job? If you ever needed proof that fabric, needle and thread were not just for women, here you go. 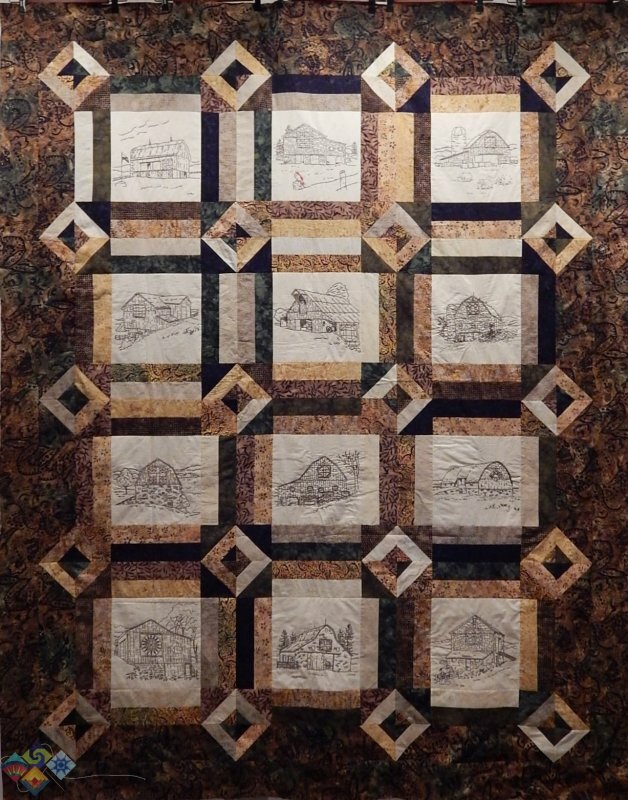 Designed by Beth Dix of Primrose Lane in North Carolina, “Appalachian Memories” is one in a line called “Mama’s Quilts” which are dedicated to her mother Dolores. We designed our Appalachian Memories block of the month program to be as simple as possible so that beginners and experienced stitchers alike can enjoy making this beautiful 74" x 92" quilt. All the fabrics for the top and binding are premium quilt shop batiks, and the thread we used is Sulky’s 12-wt in a beautiful sable brown served up on a “petite” spool. This thread is such a joy to work with, and there’s no separating of strands needed – it’s ready to thread onto your needle and go! A special feature of our program is pre-printed Fabri-Solvy sheets that let you skip the tracing-onto-fabric step. If you’ve never used Fabri-Solvy we urge you to give it a try: We print each block’s stitching design onto the soft stabilizer for you, then you peel off the backing paper, stick it to front of your block and start stitching. When your stitching is all done simply swish your block in warm water until all the stabilizer is gone, lay it on a towel to dry, and then iron it to smooth it out. It’s so easy! * We like to use a double layer of fabric for our hand embroidery – it helps hide “ugly” stitches on the back – so we use a very light tonal batik for the blocks with a layer of muslin behind it, then stitch through both layers. We also offer an accelerated 6-month program, in which you’ll receive 2 blocks every month, with the finishing kit added to the 6th month. The 13-month program is $ 22/month, and the 6-month program is $ 40/month. As with all our BOMs, there is no registration fee and shipping is always included, so no added costs and no surprises! The first kits will ship out the 3rd week of August 2014, so sign up soon! Don’t want to wait for kits each month? You can purchase the complete kit with pattern, or just the pattern, HERE.